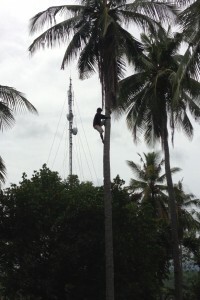 If your total experience of coconuts is the furry brown ball that’s for sale at the greengrocer, I have news for you. That’s just the inner seed pod. The layers that are missing are a smooth green or brown skin – looking a bit like a ten-pin bowl – and inside that a fibrous layer that acts as a shock-absorber, protecting the inner seed pod from damage when the coconut falls to the ground. Now that inner fibrous layer is what I really want to talk about. It’s not wasted; far from it. It’s what is known as coir fibre and eventually it makes its way into coir doormats. I say eventually because it’s quite a long process. The fibrous husks are soaked in ponds for several months to swell and loosen the fibres. Then they’re beaten to separate out the long fibres which are then dried. Next there’s hand spinning into a fine yarn and twisting to make the very long and strong coir strings which can then be loaded into large hand-looms ready for weaving the doormats. 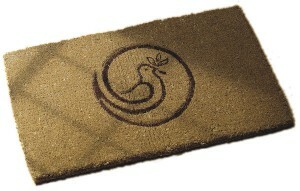 Today we took delivery of a shipment of the final product of that long process, our annual stock of Dove Doormats. Quite apart from the processing history, these doormats come with a fascinating back-story. In India most coir is made in privately-owned factories, and conditions for the workers are not normally the number one priority. But our doormats come from a very different heritage. 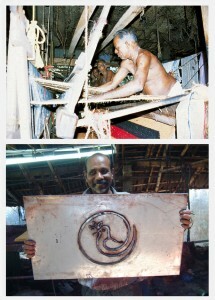 A former trade unionist encouraged coir workers from Cherthala, Kerala in southern India to form a workers’ society, and so the Shertallai Coir Co-operative Society was born. It was a huge step forward for coir workers who had for decades endured a terrible struggle for their basic human rights. In 1958 the Co-operative members bought our the business that was previously privately owned, so the venture is now wholly owned and controlled by those who work in it. The Shertallai Coir Co-operative Society is one of our fair trade producer-partners, and we’re delighted to stand in solidarity with the workers to provide a market for their eco-friendly natural products. Your support in purchasing these doormats not only helps the workers, but is also a vote for natural, renewable products, instead of the synthetic goods that threaten the livelihoods of coir workers. To me it seems a pretty easy choice between a natural product that supports rural jobs vs synthetic products that yield profits to global petrochemical giants. This entry was posted in Environment, Fair trade and tagged coir doormat, doormat, employment, environment, fair trade, india, Kerala by Brian Loffler. Bookmark the permalink.